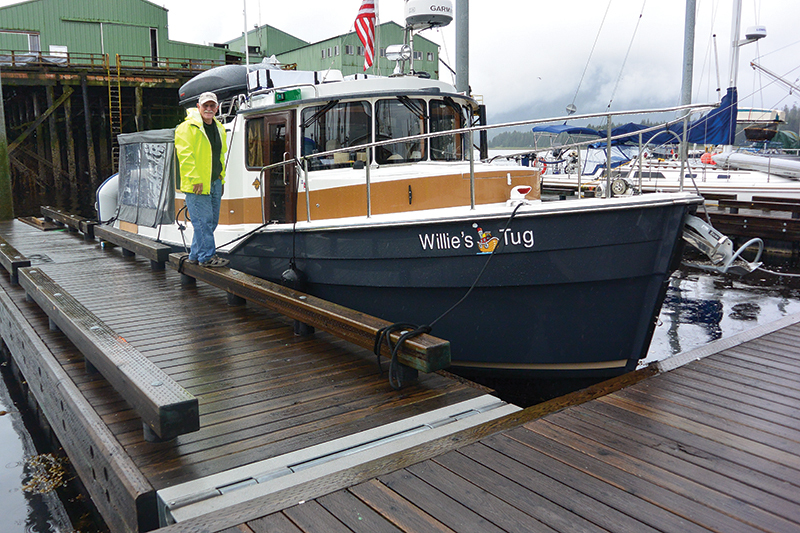 Second try—and third boat—is the charm for one couple whose heart was set on Sitka. In 2005 Herb and I took our motorhome from our residence in Longview, Texas, on a tour of western Canada and several places in Alaska, including a catamaran ride from Skagway to Juneau. We were interested in the history of the state and wanted to see more, including Sitka, which we missed because we weren’t able to get our motorhome across the water to Baranoff Island, where Sitka is located. Years later we traded in our boat, a Ranger Tugs R-27 — our second Willie’s Tug, which we trailered from Texas to the Pacific Northwest and back — for another Ranger, this one an R-31, our third Willie’s Tug. We leave this one in the PNW and don’t trailer it when we return to our southern home for the winter. 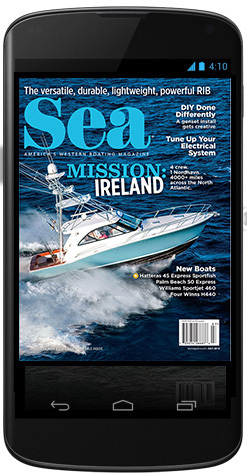 The first year on our new boat, we planned an Alaska trip, but it didn’t work out. We spent from May to September cruising Puget Sound, the San Juan Islands and the Broughtons, but still had a burning desire to visit history-rich Sitka, so on June 6, 2015, we tried again. Our friend Ray, along with his malamute, Lilly, was excited to buddy boat with us aboard Nudibranch. Sadly, we had lost our golden retriever, Dr. Jake, the year before, so we were to be a two-boat, one-dog flotilla. 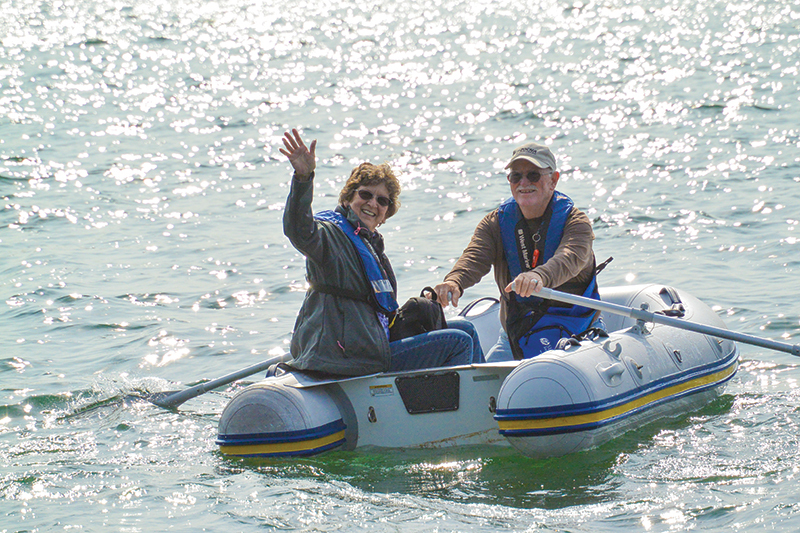 We also invited any other boater friends to tag along. 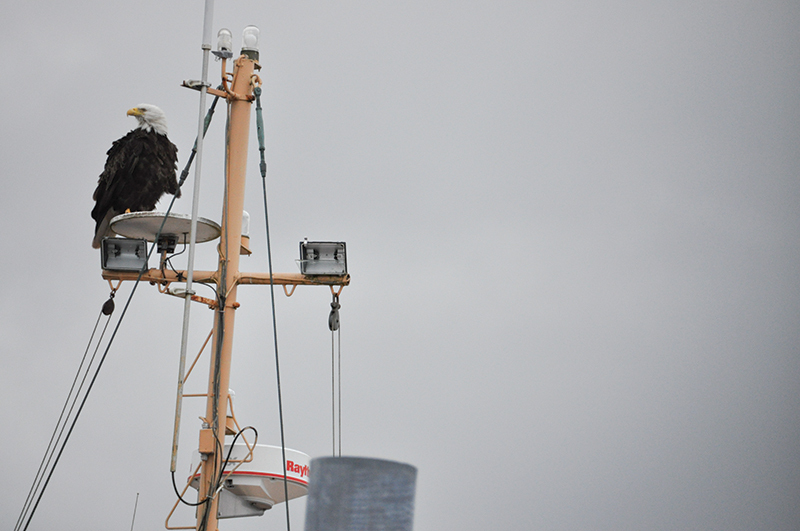 Our thrilling four-month trip up the Inside Passage went something like this. 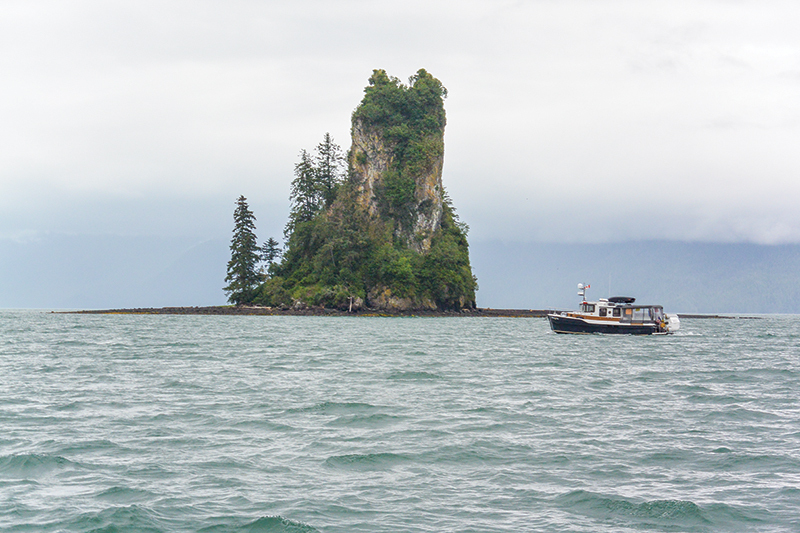 We leave the familiar waters around the Broughton Islands and spend the night at Port McNeil. At 5 a.m. the following day, we head into Queen Charlotte Strait. Herb sets the speed at 12 knots as we make our way past Cape Caution. The winds are light, as predicted, and are supposed to stay that way until late afternoon. We begin to get ocean swells, 2- to 3-footers, in the strait and we still have one and a half hours before we get to Cape Caution. We increase our speed to 14 knots, which smooths out some tops, and I look forward to less rough water after rounding the cape. Ray says later that he wished his boat had stabilizers here. Six days later we go through Watt Narrows from Grenville Channel and definitely depend on the instruments to guide us into Baker Inlet, where we will anchor. Watt Narrows has terrific current and a whirlpool, and we have trouble seeing from a distance where the entrance is. When he sees the whirlpool at the very beginning of the narrows, Herb gives the wheel a real workout to maintain direction. He has to increase the speed a bit, and all is good. A real thriller today! 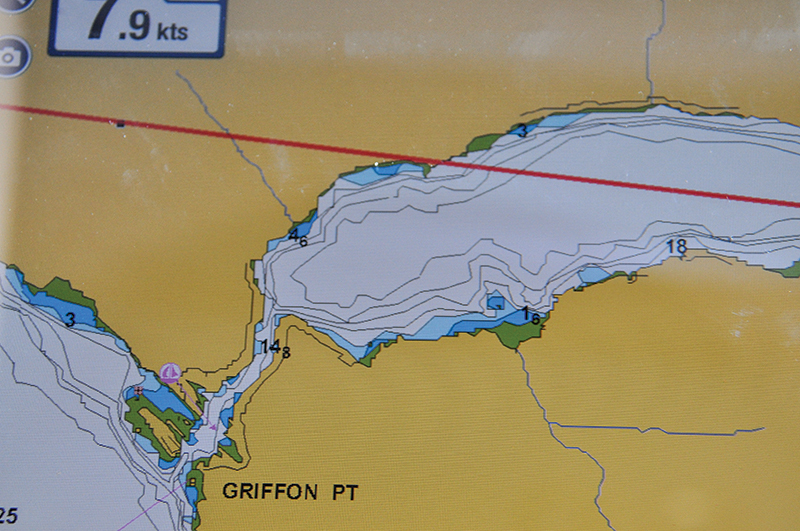 Our next exciting anchorage is three days later in Punchbowl Inlet. On our way there we get photos of New Eddystone Rock, a 230-foot rock that sits on a partly visible shoal in the middle of Behm Canal. Atop it is a small forest of healthy evergreen trees. Willie’s Tug and Nudibranch circle around to take photos of each other by the rock. Continuing north in Behm Canal, we turn into the entrance to Punchbowl Cove and I am spellbound. The scenery is magnificent. Steep walls and many, many cliffs — in front of us, on both sides — are all around us. It is truly a bowl. The granite mountains rise dramatically from the ocean floor. Herb drops the hook in 70 feet of water, letting out 120 feet of rode. Happily, we feel the anchor grab on the rocky bottom, but unhappily, it lets go. Repeatedly. Not going to set it right here. He moves out a bit deeper toward the center of the bowl and lets out more rode, gradually backing up until the boat moves no more. We are home for the night. Because it is so steep here, he stern-ties for the first time this season. 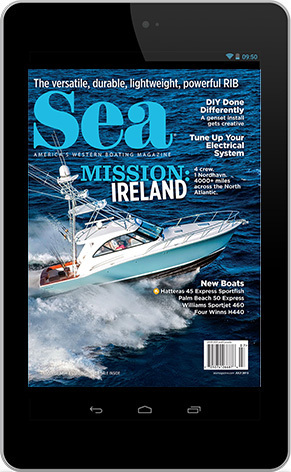 We are in 90-foot-deep water and just a short distance from shore. We expect a tide swing of 16 feet tonight, so we will watch our lines carefully. This is quite a feat to anchor on a steep wall. And how happy we are to hook on this rocky bottom. 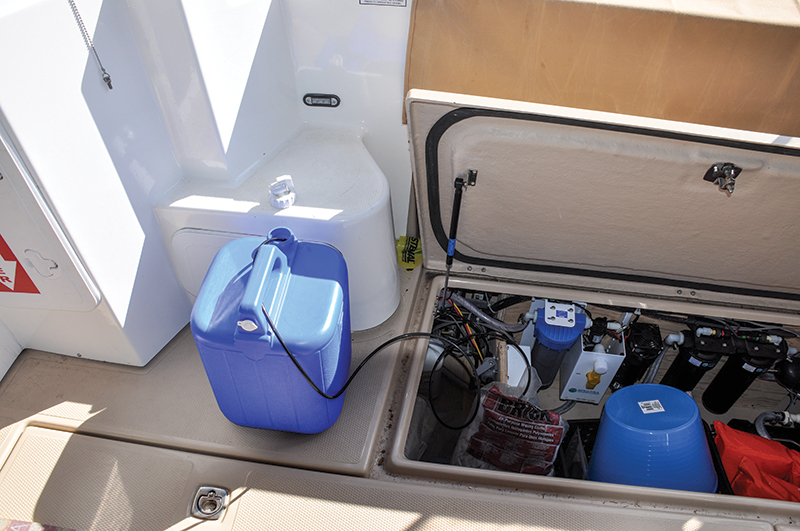 We take advantage of a long day’s cruising to our anchorage in Helm Bay to replenish our freshwater tank, utilizing our six-gallon-per-hour water-maker, since the literature says much of the water available at the docks in this area is not treated. After Willie’s Tug’s tank is full, Herb turns the Y valve to divert new product to a portable container we’ll share with Ray. We are the only two boats enjoying this flat, calm canal. Then suddenly, as we exit the north end of Misty Fjords … orcas! There are two groups, one on either side of the canal. One pod? Ray reports seeing a male and a small orca. I am filming so fast I don’t stop to think what I am seeing. This is awesome. Unbelievable! Our location is 55 degrees 57 minutes 39 seconds north, 131 degrees 20 minutes 6 seconds west, in Behm Canal. Our show lasts 16 minutes, from 11:17 to 11:33 a.m.
Travel guidebooks promise that we will see lots of wildlife, and one point of interest is Anan Bear and Wildlife Observatory near Wrangell, Alaska. We cruise near the U.S. Forest Service Ranger Station and three rangers come out on deck to greet us. We inquire about seeing the bears. Finally we arrive, anticipation heightened, and see the black bears fishing for salmon. I am not sure how many we see, since they come and go, but at least three different bears delight us in the space of minutes. As the salmon jump or swim up the falls to spawn, the bears grab one in their mouth, scurry off to their den, devour it in seconds and come back to fish for another. It is so cool to see them stick their neck out to catch a fish, miss it and try again. Ravens and eagles perch nearby and wait for crumbs. Returning to the boat we continue our cruise. We find a floating dock, and kayakers around a campfire on a grassy hill invite us to tie up for the night. Herb whispers excitedly the next morning, “Willie! Come see! A brown bear is on the shore across the bay from the kayaker’s cabin.” I can’t believe this. How much more awesome can this trip get? “And bring the camera,” he adds. We sit and watch the bear for half an hour. It eats its way down the shoreline, now and then ducking into the brush for delicious berries. He devours the leaves and limbs of a blueberry bush. Then we see him go for three clusters of devil’s club berries. The berries are such a beautiful bright red, and I enjoy seeing them in the binoculars, but I’m happy the bear gets to have them for breakfast. After a pleasant night’s sleep, we time our transit of Wrangell Narrows. Several crab-trap buoys mark the entrance to this skinny 22-mile long waterway. The locals call it one of the most difficult stretches in southeast Alaska, which becomes more treacherous as tides rip up and down its shores. Large cruise ships cannot navigate it, and the largest vessels that can are barges and the 418-foot M/V Columbia, the largest Alaska Marine Highway ferry. Those vessels can only go at high tide, which has 20-foot swings. A guidebook tells us about approximately 60 lights and buoys that mark both sides of the shipping lane. Going in, we begin to see the many red and green markers directing us off rocks, guiding us through the turns and keeping us in the deep channel. We encounter a more narrow stretch and are glad we aren’t meeting M/V Columbia here. Next we come to a set of range markers, then another set; we keep them lined up and dodge sticks. Several large boats pass us in the narrow channel. We have traversed Wrangell Narrows and move into the channel as it widens. Now that was an exciting part of our cruise! Nearing the confluence of Frederick Sound and Stephens Passage, which leads to Juneau, we get another surprise: humpbacks. Suddenly they are everywhere — both sides of the boat! They blow, dive and give us flukes. Thrilling! I see Sitka ahead and call the marina for slip assignments; luckily they have space, even though the slips are at the north end. 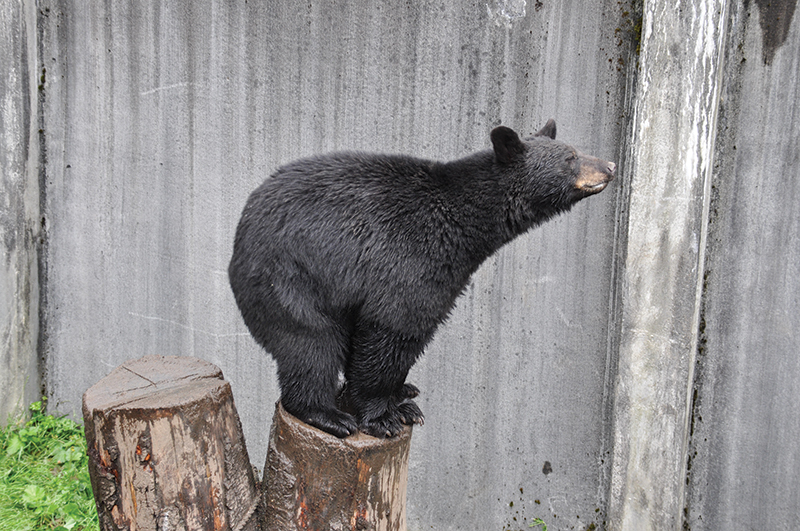 Eager to see more animals, we head to Fortress of the Bear near Sitka, where orphaned cubs are given a home, nurtured, fed and cared for, all in a natural habitat. They are happy and playful. Sadly the day comes when we must cruise south toward Texas. As we motor down the side of Baranof Island we see more orcas, glaciers, humpbacks and flukes, as well as eagles in flight. On our route home is Kake, Alaska. We arrive on a Friday and are lucky to find space available at City Dock. Several skiffs are tied here and there at the backside of the floatplane landing. Willie’s Tug is home for the night. Around noon on Saturday a kind fisherman returns from fishing and offers us a halibut fillet —what luck — which we gladly accept. He tells us to keep our camera handy to capture the eagles that arrive to devour the trimmings he throws on the floatplane dock, after cleaning his catch for the day. He says we will see more eagles here at one time than any other place. After dinner we are thrilled to hear the songs of the many eagles as they fly in for the treats left on the dock. We sit quietly inside the boat so as not to scare them off and see one pick up the halibut skin with his talons. I take a photo that shows the motion of his feet, as he tears the flesh off the carcass. He stands still a few seconds with his foot still on the halibut, turns, checks his surroundings and begins to peck away at his dinner. Three others, one of which appears spotted, soon join him. I am not sure if the spotted one is an eagle. I later learn it is a young eagle. After consuming the fish, they stay for a few more minutes before they fly away. Sunday’s weather prediction for Frederick Sound shows strong winds, so we stay in Kake another day. Seas are fairly calm here this morning, but that will change in the afternoon. 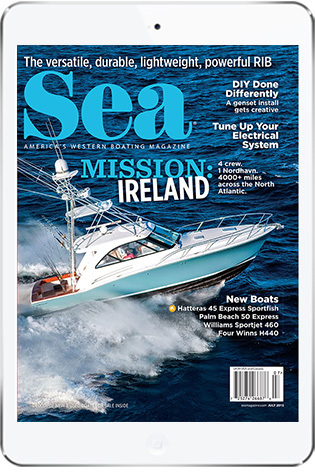 Herb asks the fisherman from the previous day — Timothy, we learn — if people dock boats where Willie’s Tug is, as we see the inside of the dock is filled with skiffs. He replies that it is a public dock. Timothy laughs. “I do,” he says. He always rafts to a boat that never goes out, and we have noticed his boat is larger than the others here. Plus, he would have an easier time and a shorter walk up the dock each day with his fish if he had his regular place, where we are. We all laugh at this and Herb tells him we will give the space back soon. We have made a friend. Do we go or do we stay? Tonight there is a bit of chop and wind to bounce us. Our reason for the cruise to Alaska was to get to Sitka and immerse ourselves in its history, beginning with the Russians, which we did. Then fate leads us to Kake, where we have a rich experience learning about this Tlingit village and the wonderful, friendly, hardworking people we meet. On Monday a touring boat anchors nearby, and Herb helps hold its dinghy to our dock, as the passengers alight for their walkabout. The updated marine forecast confirms Tuesday would be a day for us to cast off and continue our cruise south. We hear the predictions: wind speed of 15 knots, 3-foot seas, rain likely. Fifteen knots is no problem, 3-foot seas are not a problem and we don’t mind the rain, because we have windshield wipers. The issue we see is getting off the dock with the wind blowing us against it. So on Tuesday we cannot believe our eyes when we see Timothy coming down the ramp at 7 a.m., because he is usually gone by 4 a.m. to fish for several hours. We hurry to the cockpit to talk to him and he tells us he will not fish today; he is only checking on his boat and will spend time with his wife, Margo. He asks our plans, and Herb tells him we would leave if we could get out of this corner without being pushed by the wind and current against the small boat in front of us. Timothy says he can hold us off the dock, so he and Herb plan the strategy: release the bow line and hold the stern in until Herb can point Willie’s Tug out into the channel. As I pull in the stern line, we say goodbye and I quickly grab my camera for one last photo, but it rebels. We have only a memory of his kind, smiling face. The last thrill on our first trip to Sitka is getting away from the dock in Kake, and we hold Kake in our hearts.